Three diagrams from Nahum Stiskin’s 1972 The Looking-Glass God. “The principle of dualistic monism is based on the intuition common to all men that things, phenomena, and beings are in a dynamic state of change and that life is process. Plants, men, and ideas all bloom in their season and wither in their season. Day changes into night, and night returns to day; the seasons run their course; Time, the enumeration of this change, stops for no man. In daily life we find no constant. “The course of this change, however, is not erratic. We find ourselves living in a world of extremes. From midnight to midday, from the heat of summer to the cold of winter, from joy to sadness, all movement is along a continuum from one extreme to its opposite. Judging from our experience, we deduce that the universe is constructed on a plan of polarity: beginning and end, male and female, expansion and contraction, ascent and descent, life and death. Process occurs as movement between these poles of the universe. “Let us devise a practical language to use in discussing the structure and inner workings of polarity within the universe… that of yin and yang, derived from ancient China. But this is not to say we are simply expropriating that ancient philosophy as it was defined and used by Fu Hsi some five thousand years ago. We can and must redefine this terminology in such a way that modern man can make rational sense of it. This ancient principle of relativity is not a mysticism but a paradoxical logic of the universe. “We shall designate as yin all phenomena, beings, and things that are dominated by centrifugal force, and as yang those dominated by centripetal force. Centrifugality can be most easily imagined as the tendency to move from a center toward a periphery; centripetality is movement from a periphery toward a center” (p20-21). Yang centripetality and yin centrifugality (p21). “Using our newly defined principle, we will categorize density as a yang phenomenon in comparison to expansive airiness, which we shall consider a yin phenomenon. By extension, a proton, having weight and density, will be classified as yang in comparison to an electron, which, having relatively little weight and density, will be classified as yin. Movement away from the center of the earth would express the yin tendency; movement toward the center, the yang. Verticality with reference to the earth may be considered an expression of yinness, horizontality an expression of yangness. Based on this latter concept, colors may be classified as a series of changes along the continuum from red to violet. Red describes an electromagnetic wave of low amplitude and frequency that may be said to be dominated by centripetal force. 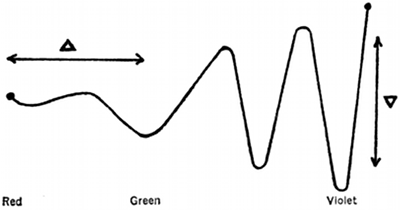 Violet describes a wave of much higher amplitude and frequency and, in comparison, may be said to be dominated by centrifugal force [see the figure below]. Heat and light are ‘centered’ phenomena: their existence presupposes a point of concentration in space and thus may be said to be yang. Cold and darkness are ‘dispersed’ phenomena: they originate at a peripheral nowhere and permeate space, and therefore may be said to be yin. Fire is yang; water, its antagonist, is yin. Shapes, too, may be classified. Shapes like △ contain their greatest bulk toward the bottom. Their movement is downward, and they are thus dominated by the yang tendency. Shapes like ▽ express a centrifugal movement upward and are dominated by the yin” (p21-22). The continuum from yang red to yin violet (p22). “If, then, the operation of yin and yang is at the core of nature, what fundamental shape will all entities and processes share? A symbolic representation of the principle of dualistic monism would have to fulfill the following seven requirements: first, it must display a polar structure of the relative world by indicating such things as beginning and end, above and below, periphery and center; second, it must link the two poles of existence indissolubly by showing them to be but the two complementary ends of one continuum; third, it must indicate the stages of change; fourth, it must show the variations of yin and yang within each stage; fifth, it must indicate the change of velocity within the process of change itself; sixth, it must demonstrate the potentiality for simultaneous movement in opposite directions between any two antagonistic poles; and seventh, it must indicate the original source of evolution and show that all evolved entities ultimately return to that source. In so doing, it must reveal the connectedness of the absolute and relative worlds, thereby demonstrating that all dualities are only modifications of an originally unified essence” (p28). “The only pictorial symbol that can fulfill all seven conditions is the logarithmic spiral and its three-dimensional analogue, the helix. 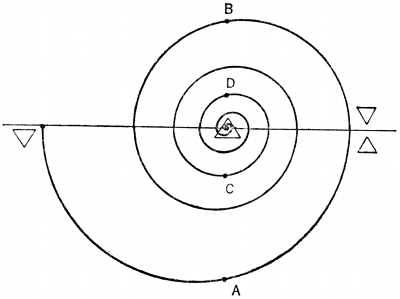 The spiral is a two-dimensional structure; the helix is its three-dimensional extension into space. The coils that curve along the ordinary screw exemplify helical structure. Thus, [the figure above] may be viewed in depth, with the periphery near to and the center far from the eye. “We see in [this figure] that the polarities of both beginning-end and above-below are clearly expressed. We further note that in a logarithmic spiral the center is dense compared to the expanded periphery. The movement from beginning to end within any process follows the line of the spiral from periphery to center. The coils are thus the continuum. All things, phenomena, and beings begin at the periphery and move toward the center. “The spiral may be portrayed with six or seven coils; each represents either a different stage from inception to conclusion of a process or different elements in the structure of an entity. Analysis into seven or eight parts is usually sufficient for an adequate explanation of the structures and processes within nature… By drawing a line through the spiral and dividing it in half, we see the variation of yin and yang within each stage. “Since the distance between coils decreases logarithmically, it requires less time to travel from points C to D than from points A to B. This is equivalent to saying that processes speed up toward their conclusion or, in terms of entities, that density is a characteristic of center. “If we take the empty space between the spiral’s coils to constitute another spiral—this one originating at the center and moving toward the periphery—we shall have indicated the simultaneity of antagonistic tendencies. We shall have also shown the dialectical identity of beginning and end, for the end point of one spiral is the origin of the other. “Finally, the empty space surrounding and leading into the spiral may be conceived to be the invisible, infinite sea of energy. The world of polarity splits into being at the first point along the periphery of the coil and returns to its origin along the inner spiral” (p28-30). wow! twitter is dumb, i live nowhere near moab, i’m from arizona, duh. It seems that there’s some synchronicity at play here. The online gnostic community is all abuzz about dualistic monism now. Please check out what’s going on at palmtreegarden.org right now. Couldn’t help but think of the archetypal hour glass looking at the inverted triangles beside the coil diagram. Great site / blog by the way.